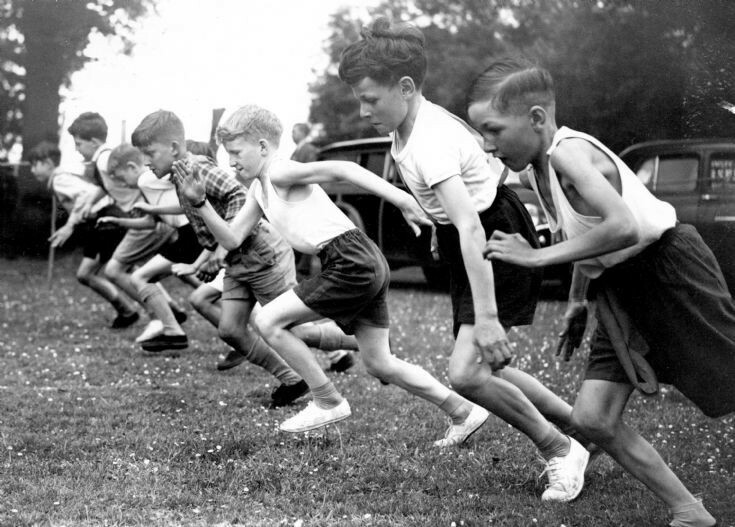 Further to picture #2142 the above photograph is of the start of a race for 10-year-olds at the Handcross School sports day in 1958. Second from the left is Andrew Cook, and third from the right is Laurence Ray. The Large Version shows the equivalent race for the girls. Nearest the camera is Dawn Walder, and third from the right is Jackie Messer. The result was:- 1 Brenda Fraser, 2 Jackie Messer, 3 Anne Fiest. Please can anyone identify others? Select Open document to view the newspaper cutting naming all the successful runners. I would suggest the line up is, from right to left, Paul Pierce, Christopher Zuidyk, Laurence Ray, David Haynes, Stephen Cox, Andrew Cook, and unknown. On the extreme left is possibly Colin Miles. As for the girls race, 4th from the right is, I think, Elizabeth Hawksworth. In the girls race, 2nd from the right looks like Wendy Sired.